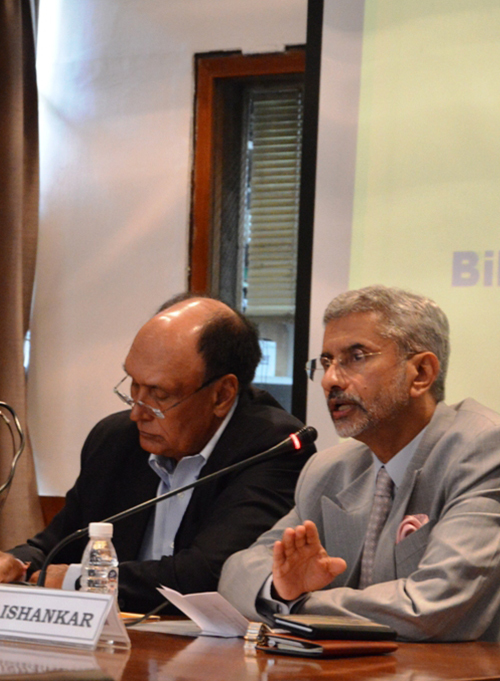 The Delhi Policy Group (DPG) organized a policy seminar on "India-China Relations: Bilateral and Regional Contexts" on September 14, 2016. The event was attended by around 50 participants from think tanks and the strategic community. The seminar opened with a keynote by Dr. S. Jaishankar, Foreign Secretary who delineated the context and content of India-China relations, from historic interconnections and modern era interactions to current day challenges of expanding and managing stable relations. The first session of the seminar was devoted to a discussion of India-China bilateral relations. Speakers and participants noted the asymmetric power equation between the two countries and China’s muscular assertions as well as its growing ability to shape the discourse on bilateral ties and regional issues. They agreed that India would have to counter this trend through the projection of an alternative narrative based on its own interests and perceptions. They observed that China was going through a period of domestic uncertainty. Its economy was witnessing slowing growth, overcapacity and an as yet unsuccessful effort to rebalance investment and consumption. China under President Xi Jinping had asserted stricter party discipline and control over the economy, party cadres and the PLA. President Xi had moved decisively to define foreign policy. India would have to factor in the defence and security implications of China’s new assertiveness. The second session addressed developments in India-China relations in their regional context. Speakers and participants noted that there was a diversity of views in the United States on what should be done to counter China’s increasingly assertive behavior without impacting economic ties. Nevertheless, the United States would continue to be the principal security guarantor in Southeast Asia. China’s economic slowdown and push for dominance has opened new strategic space for India in Southeast Asia. India on its part needed to actively push forward regional economic integration through RCEP and step up security ties with regional countries. CPEC and OBOR are strategic projects seeking to reshape the region and India needed to develop a counter strategy. China has engineered a remarkable expansion in its maritime military power projection and is now establishing bases in the Indian Ocean region. India would have to beef up its own asymmetric capabilities to deal with the consequences of China’s naval buildup, leveraging its geographical advantages. DPG does not take specific policy positions; accordingly, all views, positions, and conclusions expressed in this publication should be understood to be solely those of the author(s).